Today is my parents’ wedding anniversary. Just look at them – aren’t they cute? 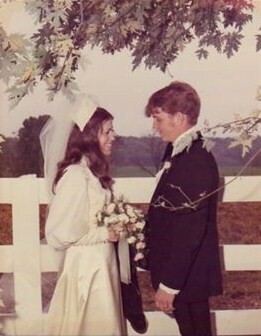 My mom and dad were high school sweethearts, married at the ages of 18 and 20. I think they first met when Dad shot spitballs at Mom from across the school auditorium, or something like that. Regardless, Mom arrived home too late to announce the news to her parents and didn’t want to spring it on them on their way out to door to Mass the next morning, so (you can see this coming, can’t you?) Grandmom and Granddad learned of their 17-year-old daughter’s engagement from acquaintances at church. Amazingly, they somehow still grew to be okay with it. 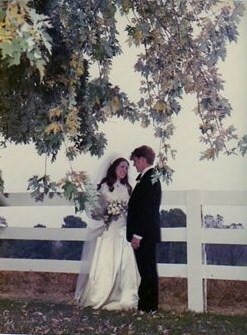 When Mom and Dad married a year later, they held their reception in my grandparents’ yard. Their bridal party was huge because between them they had eight sisters and three brothers. Mom’s cousin was her maid of honor; Dad’s friends filled out his side. All the dresses were homemade, including my mom’s, which her aunt (and Godmother) had provided the fabric for. Mom finished sewing her dress the night before the wedding. Various family members provided hams and roasts, etc. for the reception and my great-grandfather hired some women to serve it. Mom’s three-year-old sister was her flower girl. I believe my aunt spent part of the wedding tugging on the priest’s robes. Or at least, this is the story I grew up with – the background to my fantasies and the model for my own expectations. In my book, it was the ideal – probably because my parents were. I have always known that I was lucky to be born of my parents and their marriage. They, and it, are not perfect, of course. They have their squabbles and their struggles. But in the 36 years I have known them, and it, their love for each other has always been hugely obvious. Like, neon-sign obvious. Mom and Dad are loving and flirty. They’re considerate and (sometimes underneath a few grumbles) patient. They support each other and they were always a united front in raising my brother and me. I guess I always expected to follow a path similar to theirs. But mine took a different route. No homecoming crown, no high school sweetheart for me. No teenage marriage. Not even one in my twenties. No, unlike my parents, I went off to college. I traveled. I saw six foreign countries and countless American cities before I turned 25. I spent my twenties not changing diapers and chasing small children, but working late hours, reading stacks of books in my tiny apartment, and taking my little cousins out for ice cream when I got lonely. I met my husband via the internet, not a spitball. It was good – just a different kind of good from my childhood fantasies. My marriage is different from my parents’ too. Brennan and I are less flirty, our love is not so neon obvious. But it is good. It is solid. And like my parents, my husband and I try to be considerate and patient. We are supportive of each other and we are a united front in raising our boys. I think we have my parents much to thank for this. They’ve provided me with a lifetime’s worth of examples of a good marriage, and they’ve been eight years of wonderful to Brennan. Thank you, Mom and Dad, for all you’ve done and for all you continue to be to us. Congratulations on what you’ve accomplished together. Enjoy your beautiful (and hopefully delicious) day. So very sweet. Happy anniversary to them! Love this! Makes me think of my own parents who married at 18 & 20…I was 28. I, too, traveled the world and met my hubby in Germany…and didn’t have baby #1 ’til I was 34 (not really by choice.) My dad passed away nearly 2 yrs. 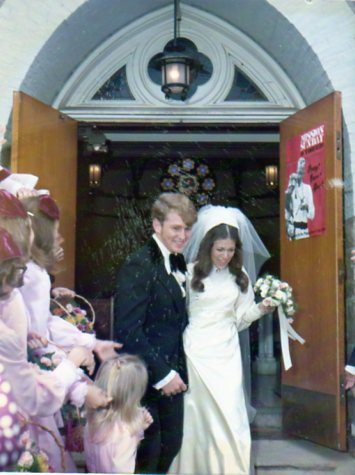 ago exactly 1 week shy of their 50th wedding anniversary. You are indeed blessed to have your parents and for them to be such wonderful role models! Wow, I loved loved loved this! And it’s so true that we don’t all have to have flirty marriages. “Brennan and I are less flirty, our love is not so neon obvious. But it is good. It is solid.” My marriage is like this. I’m married to an engineer and I like the rhythm of our marriage. It’s quiet but solid like steel. We like to sit next to each other and read books! What a lovely story, thanks for sharing! I can never get enough of learning how people met and fell in love. We need more Catholic love stories! What a sweet story and great example for all married couples! This is so sweet! I think y’all both have ideal stories, just different. I’m super impressed that your mom made her own dress; she looks gorgeous! Beautiful post! I know it was a bit challenging for me to adjust to the fact that my marriage wasn’t going to look like my parents’–and wasn’t supposed to! They continue to provide such a wonderful model of married love, and of parenthood. But it’s true that their example still bears fruit in their children’s lives, even when the details are different. 🙂 Praise God for holy marriages! What a sweet reflection, Julie! It’s really awesome to see the different ways in which God works in our lives, even when they look very different God brings us good things. 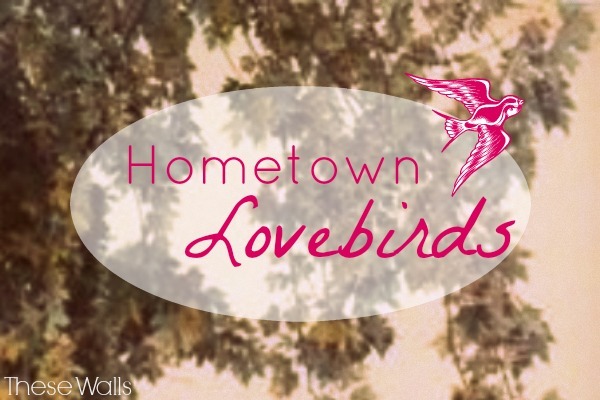 I so appreciate your blog Julie! You are so thoughtful and I love reading about your values and your family! Love this post about your parents. God bless them and their marriage!